AirParrot and Reflector App are versatile tools to use Apple’s AirPlay function to mirror screens. The well-known function of AirParrot for Mac or AirParrot for Windows mirrors the computer screen to Apple TV (2nd and 3rd generation). Using Reflector for Mac or Reflector for Windows PC turns your computer into an AirPlay receiver and enables AirPlay screen mirroring from iPhone, iPad or iPod touch to computers. In addition, the team play of AirParrot and Reflector results in more, little-known prospects: Installing both AirParrot and Reflector on a Mac and Windows PC enables AirPlay screen mirroring and desktop extension between Mac and Windows PC. 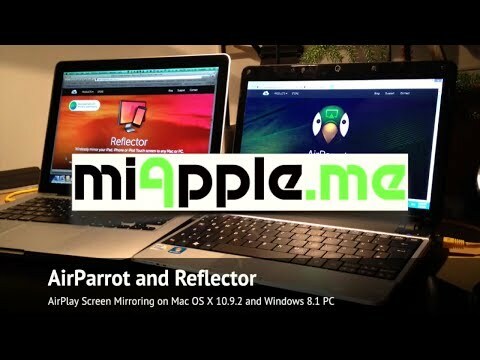 The team play of AirParrot and Reflector App is a seamless solution to mirror your screens between Mac and Windows PC. Mirroring from Mac to Windows PC exhibits multiple options. The installation of Reflector (or any other app turns your computer into an AirPlay receiver) is needed. AirParrot on your Windows PC is also necessary for AirPlay screen mirroring from Windows PC to Mac. AirParrot on your Mac can be replaced by the native Mac OS X AirPlay function (Mac OS X 10.8 and higher). However, the AirPlay screen mirroring options are reduced.